Taste of Perth 2015 is in it’s second year and Perth foodies and wine lovers are gearing up for it. Held in 22 cities around the world, Taste is touted as ‘the world’s greatest restaurant festival’. Thirteen of Perth’s top restaurants will each offer four dishes in tasting-size portions, allowing punters to put together their own progressive lunch or dinner. The festival is broken into afternoon or evening sessions of four hours duration on Friday and Saturday, either 12pm-4pm or 5.30-9.30pm, and a five-hour afternoon session on Sunday 12pm-5pm. Entry starts at $36 per person for general admission ($4 increase from last year) and from $135 for VIP tickets ($20 increase to last year). Get your wallet out. You need to do this as soon as you walk in to purchase the festival’s currency, Crowns: 1 crown = $1. Last year, a few complained at the cost of the dishes. This year, every restaurant will offer one dish at $6 ($2 cheaper than last year’s cheapest dish), or rather 6 Crowns, the currency of the event. Prices range from $6 to $32 per dish – the most expensive is for Nobu’s 9+ Wagyu Capracio with quail egg. Seems that dishes average between $10 to $15. Crowns are now refundable (they weren’t last year). This is a great improvement and means that punters can load up their cards and spend what they like, knowing they will be refunded at the end of the session. Loading up and getting a refund on the crown card was painless – very easy and hardly any waiting in queues. Last year’s Bib & Tucker suckling pig slider, 10 crowns. Beautifully balanced thankfully, which made it worth the wait. The good new is that it’s only 8 crowns for this slider this year. 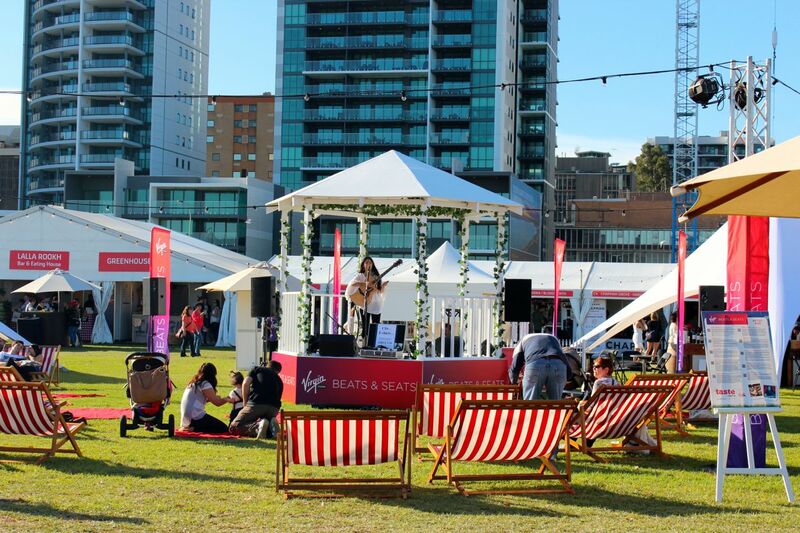 The best thing about Taste of Perth, besides the central location, city skyline backdrop and pretty event set up, are the information sessions and demonstrations. Book into sessions as soon as you arrive because the popular ones fill up. Some sessions cost, others are free. From Create your own Margaret River Red (wine blending workshop) to Know your Craft (beer making raw ingredients), special skills sessions and cooking demonstrations, choosing what to attend is a balancing act. UPDATE: Some sessions you can pre-book. I tried to pre book into the Create your own Margaret River Red session by email at 3pm (session at 8pm) – I did get a response at 6.30pm saying that the session was full. I also tried to register when we arrived at 6pm, but it was already sold out. Last year’s Bistro Guillame Beef Daube on a bed of Paris mash 14 crowns. Tender beef that just fell apart. I’ve already decided I’m going to have a Paleo-free day (I always said I’d do Paleo 80% to 90% of the time, and I do), I’m going to indulge in all the things I’d otherwise avoid. Yes, I might regret it later on with a dodgy tummy and feeling icky, but at least my taste buds won’t be left wondering. UPDATE: I strayed from the paleo way and enjoyed a donut with peanut butter icecream. I felt so naughty eating it and was on a massive sugar high afterwards. El Público – trying the twice cooked sticky lamb ribs. UPDATE: the honey cake was every bit as good as I remembered from the sliver of a taste I had last year. I also converted three friends to be honey cake lovers. UPDATE: I missed out on this – the session was already booked out. My overall favourite thing – chatting to producers about what they grow or make. Hearing them tell their stories with such passion is always inspiring. And I could talk food and wine ’til the cows come home. I love the event set up. It’s easy to navigate, there’s room to move, places to stand and eat or sit and relax, and enough exhibitors to keep one amused for four hours. The music stage in the centre of the event created a lovely atmosphere. Little details such as covered garbage bins made the site clean and appealing. Hay stacks, giant tee pees, rugs, a ping pong table, and the instagrammer’s favourite ‘taste’ letters near the entry all contribute positively. The guys at Brand Events (event organisers), do it well. Last year, tasting this gorgeous Honey Cake on my way out was a definite highlight. This traditional bohemian recipe is a winner. It’s a natural light fluffy honey cake with layers of caramel and ground walnuts. The lowlights last year would be the waiting time for some of the dishes, the liquor licence that prohibits alcohol tastings and drink sales 30 minutes before the event closes, and the prices of some tasting plates. Taste of Perth is foodie heaven, and cashed up foodies will have a brilliant day out. Last year it is not a cheap day out, then again, it’s rare to have the chance to taste dishes from some of Perth’s premium restaurants in one place. It’s great to see some cheaper options available this year.